Alain Passard is one of the iconic chefs of France, and has held three Michelin stars since 1996. In his earlier career he became a two Michelin star chef at the tender age of 26 at Casino d’Enghien, in 1986 purchasing an existing restaurant (l’Archetstrate) from celebrated chef Alain Senderens, and renaming it Arpege, after the perfume from Lanvin. Passard caused a major stir in culinary circles in 2001 when he announced he was going to concentrate on vegetarian dishes, and although there are now meat dishes on the menu, vegetables are still the star. Passard gets his vegetables from his own dedicated farms and gardens in the northwest of France, shipped daily by train to the restaurant: they are of superb quality. 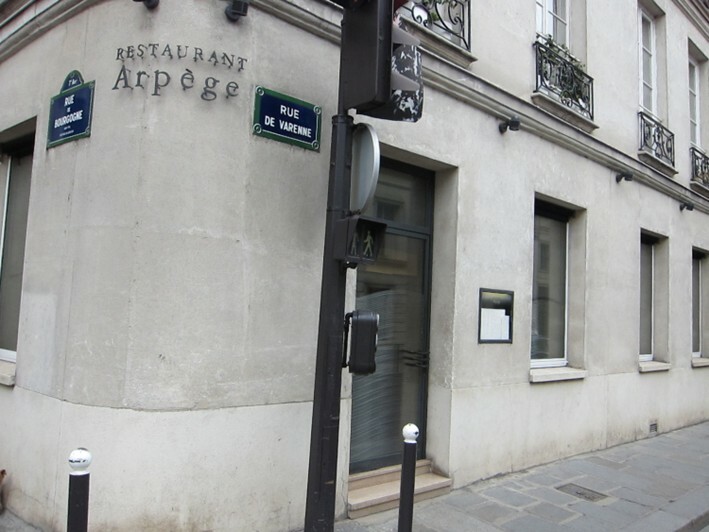 Arpege has an unprepossessing exterior, tucked away in a street near the Museum of the Army in the 7th arrondisement of Paris. 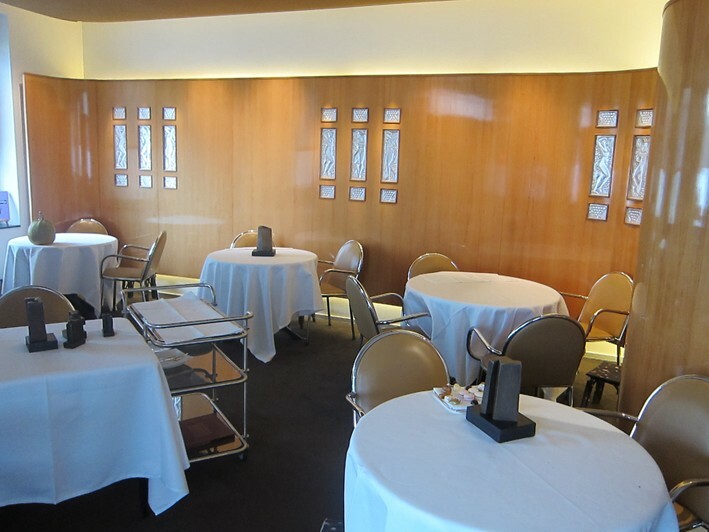 The dining room is simply decorated, with relatively small tables placed quite close together. The room is carpeted with some wood panelling along the walls. 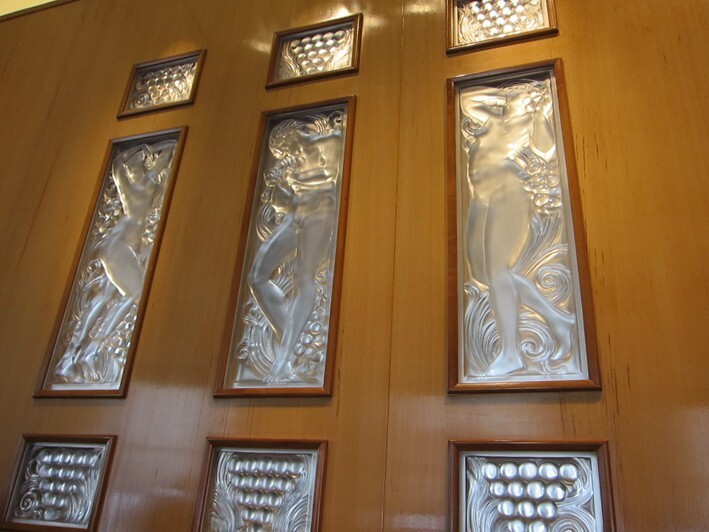 The only real luxury in the décor is the set of Lalique glass insets in the wood panels. The full-blown tasting menu with truffles, which is what we went for, was €360 (£300) per person on my most recent visit, but there was a cheaper lunch tasting menu available at €130. From the à la carte menu, starters ranged in price from €58 - €96, main courses were €80 - €182, and desserts were priced at €34 to €40. Water was €7.50 a bottle. The wine list stretched over 33 pages, and was all French other than a single page of wines from elsewhere in the world, plus a few German wines. Mark-ups were not as high as in many top Paris restaurants, though they varied considerably through the list. Growers were top-drawer, although the dessert wine list was surprisingly limited, with a rather small choice by the bottle and just a single wine by the half bottle (and that one being Yquem). Examples from the list included Chard Florine J F Ganevat Blanc 2008 at €65 for a wine that retails at around €16, the lovely Carl Schubert Maximin Grunhaus Abtsberg Riesling Spatlese 2008 at a hefty €120 for a wine that you can find for €20 in a shop, whilst Pontet Canet 2004 was €210 for a wine that will set you back around €88 in the high street. At the prestige end of the list, Vega Sicilia Unico 1994 was €690 for a wine you can find for €314, and Chateau Latour 1982 was €5,300 compared to a retail price of about €1,922. We drank Trimbach Cuvee Frederich Emile 2005 at €100 for a wine that you can find in a shop for €36. 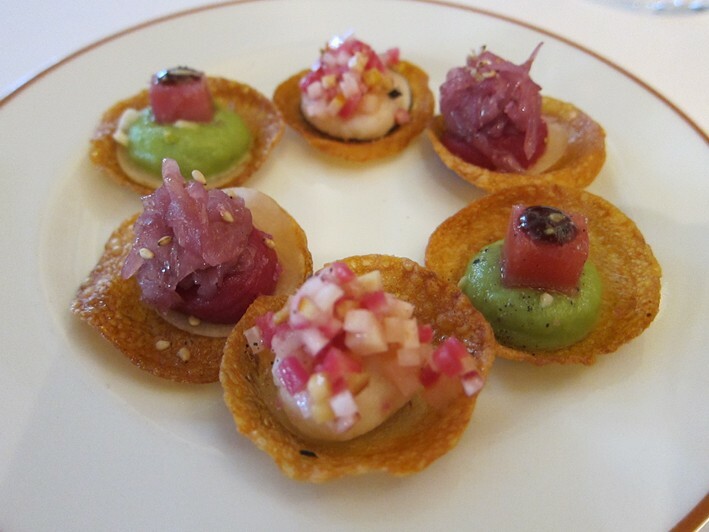 A set of little tartelettes appeared as we looked at the menu. A tartelette of Parmesan and celeriac featured superbly delicate pastry and celeriac with terrific flavour, as had tartlets of black radish. However even better were the tartlets of beetroot and parsnip puree, smoking of the beetroot in the process giving a fabulous flavour to the puree. This was an impressive start to the meal, immediately showcasing vegetables (20/20). Bread was excellent, made with natural yeast and served with butter from St Malo (19/20 bread). A long-term signature dish at Arpege has been the “hot cold” egg. 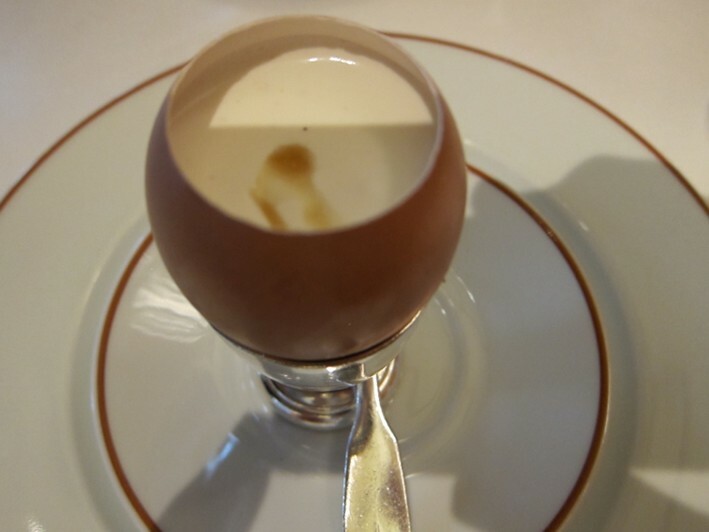 An egg shell is the presentation vehicle for warm egg yolk with sherry vinegar and maple syrup, spices and a little salt, covered with a layer of cold cream. The key to the success of this dish is the quality of the eggs used and the perfect balance of the vinegar with the sweetness of the syrup, together with the blend of hot and cold temperature elements. A deceptively simple dish, and yet a lovely start to the meal (20/20). 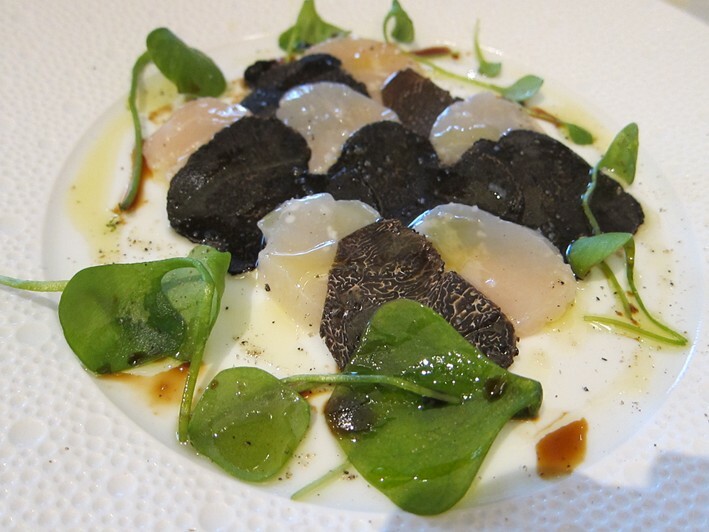 Next was a carpaccio of scallops with black truffles, pretty presented as alternating discs, garnished with rocket leaves and drizzled with olive oil. The scallops were of dazzling quality, their superb sweet flavour pairing well with the earthiness of the truffles (20/20). The best dish of the meal now arrived. 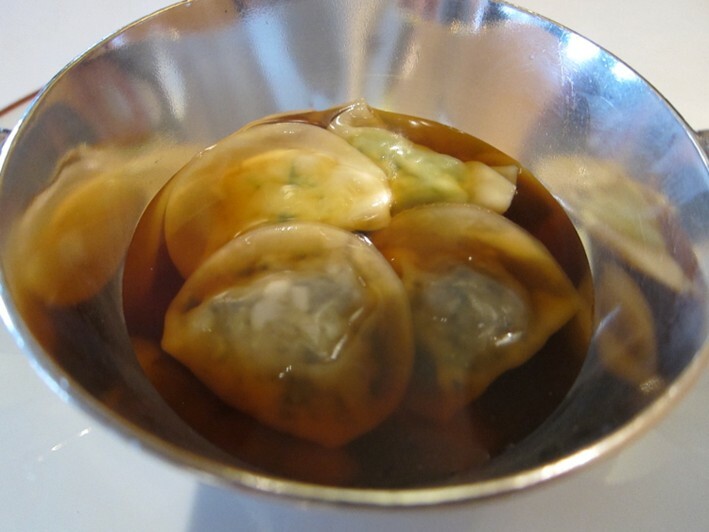 Ravioli of vegetables rested in a consommé of Jerusalem artichoke and celery. Such a simple description does not do justice to the stunning purity of flavour that came through in the consommé. The ravioli was of flawless texture, the mixed vegetable filling of the pasta again showing off a quality of vegetables that is hard to imagine if you are used to the calibre of vegetables that we see in the UK in Michelin-starred restaurants. This was a deeply impressive dish, something whose memory will live me for a long time (20/20). It was hard to follow a dish like that. 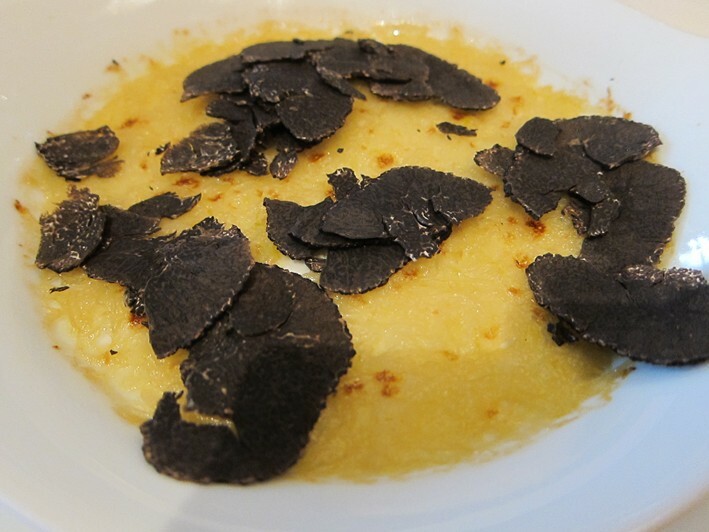 Next was a Parmesan gratin of onions with black truffle, another famous dish here, and another whose raw description does not do it justice. The Cevennes onions used here are the finest of all onions, having a mild, sweet flavour, here caramelised to further enhance their natural sweetness, the flavour combining beautifully with the Parmesan and top quality black truffles: terrific. 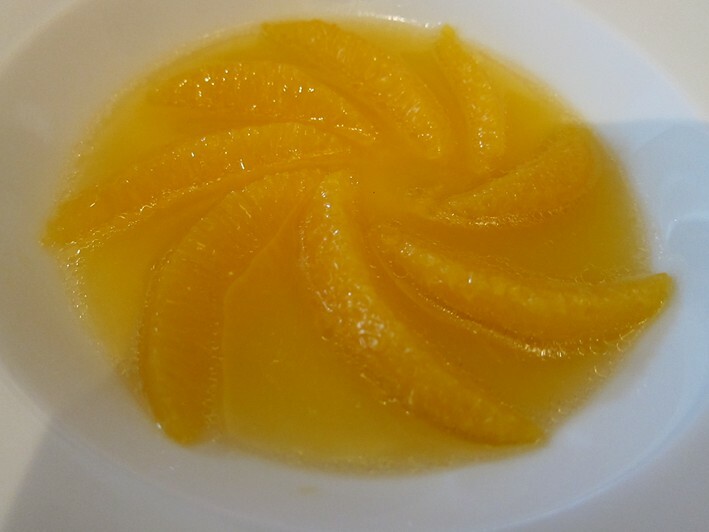 Next was zander with lime oil and green tea, with an orange and carrot mousseline. 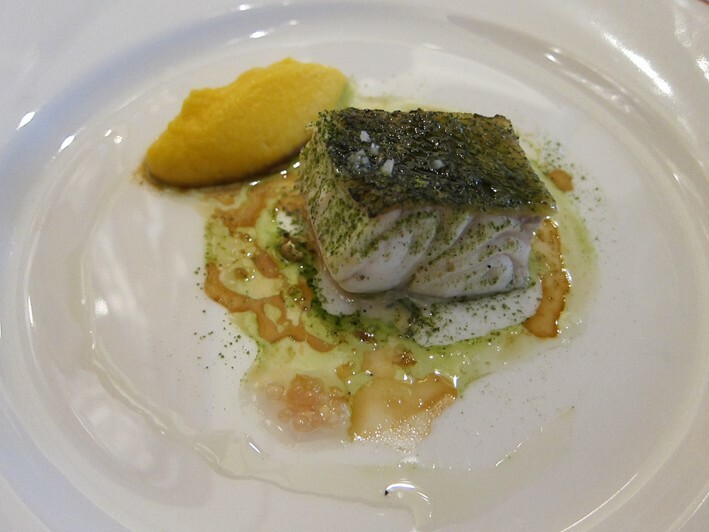 The fish was perfectly cooked (it had actually been cooked in a salted crust), the acidity of the orange an interesting balance to the slight sweetness of the carrot (19/20). This was followed by a “vegetable couscous”. Yellow beetroots, red beetroots and radishes were given an extra textural element of semolina flavoured with nutty argan oil. Amongst this was a particularly impressive vegetarian sausage, the filling of red vegetables and spices creating an effect reminiscent of the taste of a meat sausage, yet entirely vegetarian (except for the sausage skin itself). This dish was again all about the sheer quality of the vegetables, the beetroot in particular having remarkable flavour (20/20). 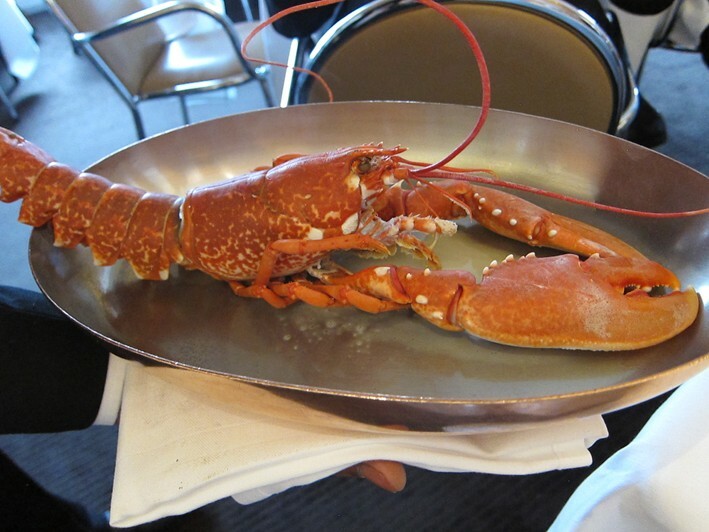 The next dish was lobster from Chausey (islands off the coast of Normandy), which was presented at the table prior to the meat being extracted from the shell and served. 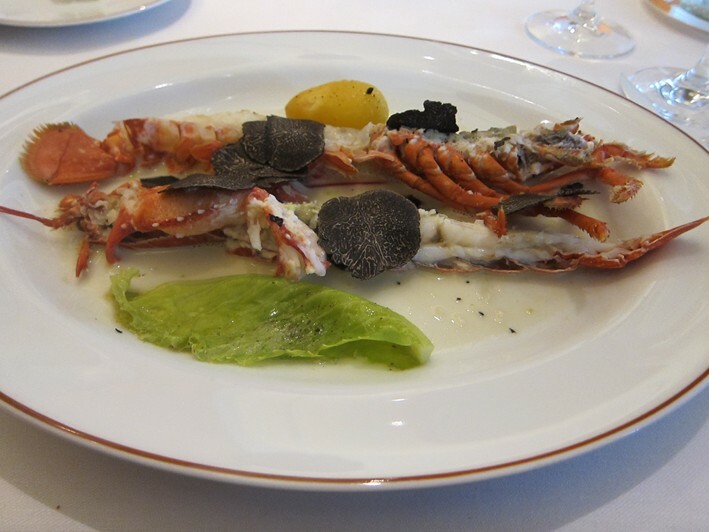 The lobster was cooked in vin jaune made with a Jura wine and flavoured with truffle, served with smoked potato. As one might expect by now, the cooking of the lobster was flawless, the meat tender and having lovely flavour, the smoked potato and truffle flavours balancing the shellfish well (between 19/20 and 20/20). 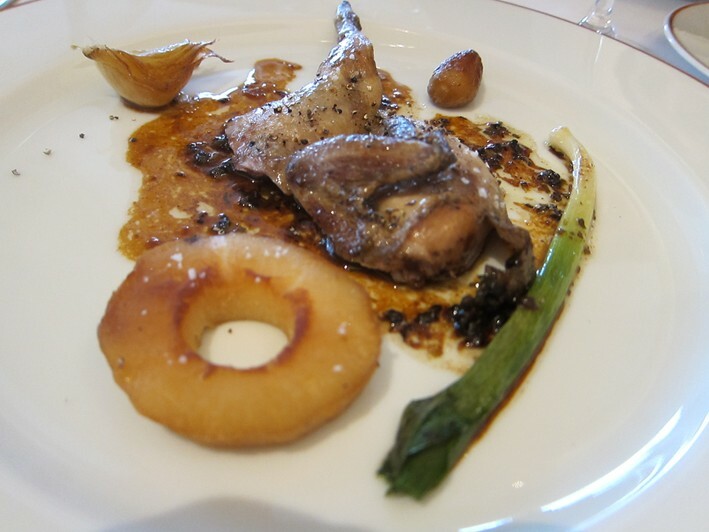 My final savoury course was quail simply roasted with black cardamoms, served with a little of the cooking juices and confit garlic and onions. Again it is hard to do justice to just how good this dish was, the quail having fabulous flavour and being cooked to perfection. I am particularly fond of quail and have eaten it in top restaurants many times over the years, but I have never eaten a better quail than this (20/20). 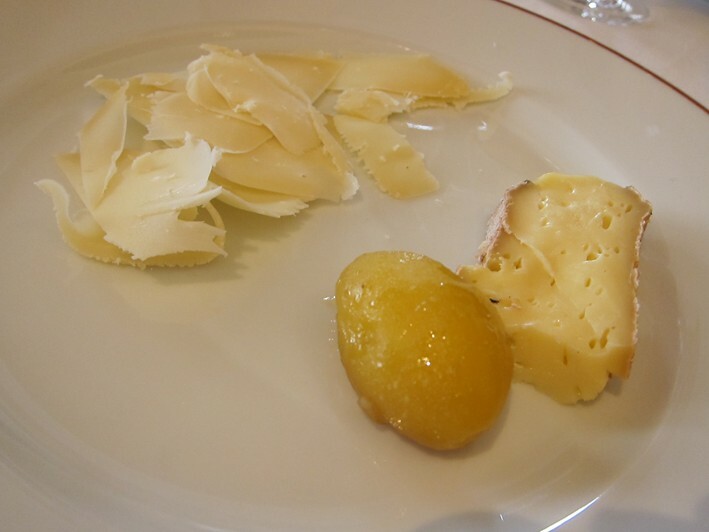 Cheese is supplied by Bernard Antony of Alsace, and it was interesting see that Arpege does not serve a full cheese board, but selected just a couple in perfect condition, Moelleux du Revard and Gruyere in this case, served with more smoked potato. 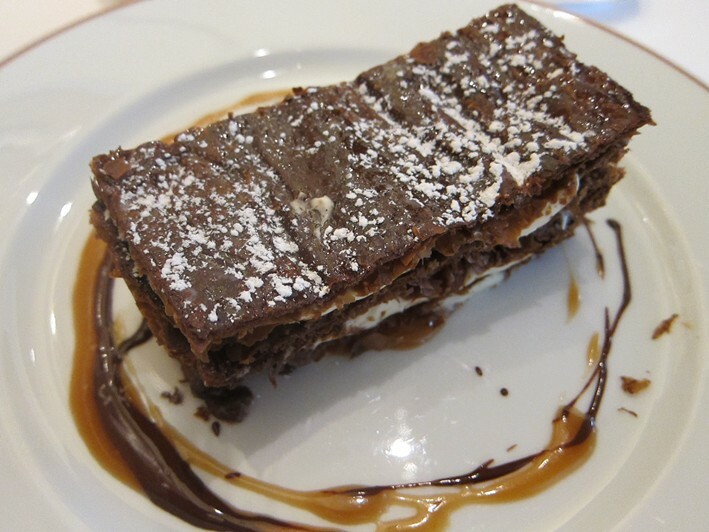 The main dessert was a magnificent chocolate millefeuille with exceedingly delicate pastry, a lovely and rich yet delicate dessert (20/20). This was followed by a superb little apple tart with almonds with a caramel sauce, another dish that could not be faulted. 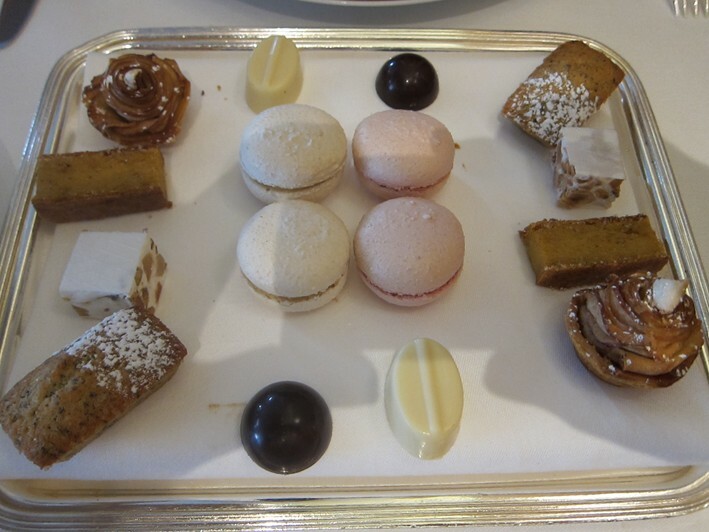 Even the mignardise kept up the standard, with a miniature version of the apple tart, the best nougat I have tasted, ethereally light macaroons, a financier with sage, and both white and dark chocolates. What is impressive to me is the simplicity of the cooking at Arpege. Many dishes have just two or three elements, but employing impeccable ingredients and put together with flawless technical skill. There is nowhere to hide with such cooking, but time after time in this meal I was struck by the remarkably purity of flavour of the dishes; here cooking is stripped back to its essentials. Of course there is always a reckoning for such indulgence. The bill came to €479 (£400) per person including drinks, which is clearly a great deal of money for a meal. But what a meal. Thanks Andy for another brilliant recommendation! My wife and I went to the wonderful Pres d'Eugenie last summer on our honeymoon, and although we swore at the time that this sort of thing would be a once-in-a-blue-moon indulgence, we were so curious to try some other three star restaurants that here we are six months later visiting Arpege and Troisgros in the same week. Our lunch at Arpege yesterday was perhaps the most memorable meal of our lives so far: the presentation of the food is mostly quite simple although very elegant, but the flavours are extraordinarily complex and intense, and the accuracy of the cooking is flawless. One of my favourite dishes for its originality and boldness of flavour was a beetroot sushi, with a beautifully tender slice of marinated rainbow beetroot, a lemon gel, wholegrain mustard in place of wasabi and a tapenade playing the part of soy sauce. This didn't feel like fusion food, instead it was as if the concept of sushi had been translated into perfect French. Other favourites were a mousse of scallops and Jerusalem artichoke served with a Jura wine sauce which had a beautiful balance of sweet and nutty flavours, and a chocolate millefeuille with orange and argan oil which was ethereally light in texture but again remarkably intense in flavour. 175 euros may be a lot for lunch, but given that this was for 11 courses of the most exquisite food not including appetisers it actually seemed rather modest. On that note I would suggest booking an early slot, because although we were the last to leave we found we had to keep up quite a brisk pace in order to finish everything, especially when it came to the desserts which made us feel like ten year olds let loose in the world's greatest patisserie: there were three plus two trays of petit fours (we thought the second one may have been a mistake but we didn't complain). In short we cannot recommend this restaurant enough. It's hard to imagine anything following it but we are nonetheless looking forward to Troisgros tomorrow. Going there since 1986. Every meal memoramble. That's how I judge a restaurant if I can remember the dishes. I visited L'Arpege in 2003 and only ate two dishes, a soup and a salad both were vegetables-based and took a drink of Dom Perignon 1988 and was amazed what Alan Passard could do with vegetables. The service was excellent: not cheap to say the least, but a unforgettable experience. My wife and I ate here in late 2007. The food was indeed phenomenal. There is a lovely little converted wine cave down a stairwell off of the reception that hosts 5 or so small tables and is quite romantic if that sort of thing is required. The service was flawless. We had gone in expecting to try the tasting menu, but were more intrigued by the a la carte side of things. Our server suggested that we order a selection of stuff off of the a la carte menu and do split plates. That they suggested that was astounding in and of itself, and we were clearly getting more than half portions on each plate. To do it in this manner is highly recommended, and provides a nice, more customizable, and more wallet-friendly alternative to the tasting. They were bending over backwards to accommodate us. Among the finest restaurants we have or likely will ever go to. 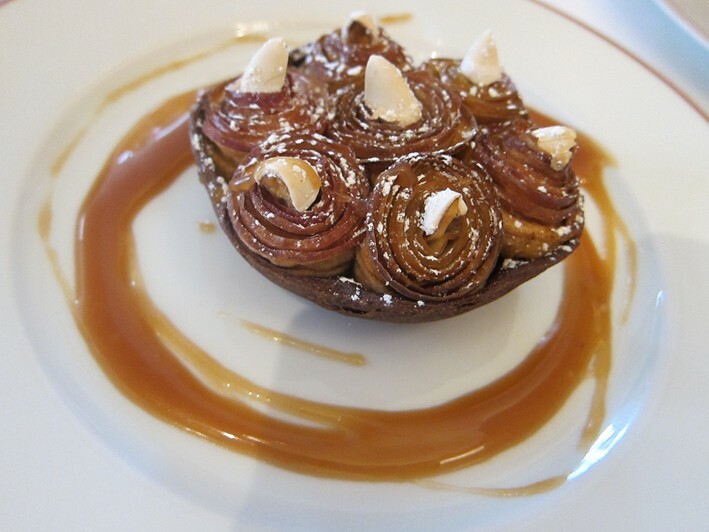 I flew my wife to Paris for Valetine's Day this year and went to Arpege for a memorable dinner. I must say it was a disappointing experience. The prices are ridiculous, decor inadequate for a three star restaurant and food just okay. We had better meals at many two star restaurants in New York, Luxembourg, London and Paris. They really need to revisit those prices when there is no correlation with the quality of food! * Food was very good. 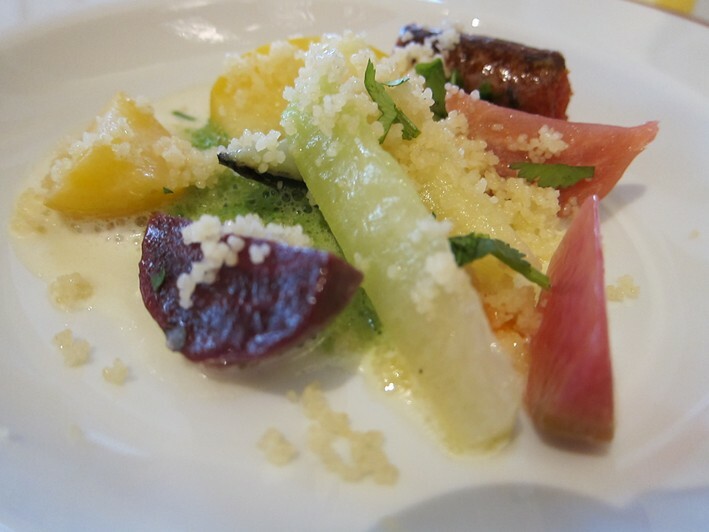 I thought Alain relied a little heavily on sweet flavors with the vegetable dishes, which did feature some unusual combinations of flavors and ingredients and very good presentation. Some of the best vegetable dishes I have had! There was an egg dish (first real course after the amuse bouches) that was transcendent (especially with the 1990 Mersault I ordered) - for me, that was the culinary highlight of the meal. 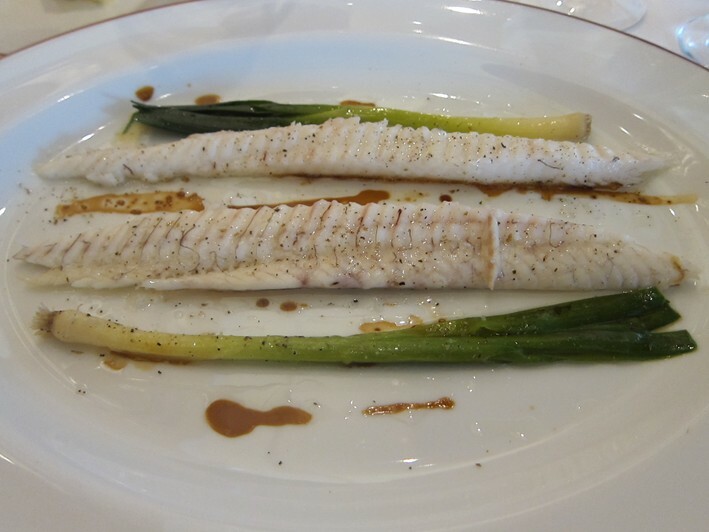 There was also an amazing delicate white fish, which was also transcendent. Three non-vegetable dishes in our tasting menu (fois gras, lamb, fish). * Very nice space. * A wine list that has lots of great wines, but not too diverse. * Alain was nice - we chatted with him twice. * Service was fantastic though degraded slighty after the 4th hour had passed - or maybe we ourselves degraded. * Yes, it was very expensive - tasting menu is now 360 Euros a person (May 2008). I note your last visit was 2003. We had dinner at this place in December 2006. I can only say we were extremely disappointed with the whole experience. Starting with the silly prices (even by Paris standards!!) to the fact that the whole place really rather overdid the vegetables & no oven theme. The selection of meat dishes was very small. The decor of the place seems high energy 1970"s. This is another example of Michelin going for glitz/"innovation" at the expense of sitting down and actually tasting the stuff on the plate!! Definitely not a 3 star place at all in our opinion & best avoided. 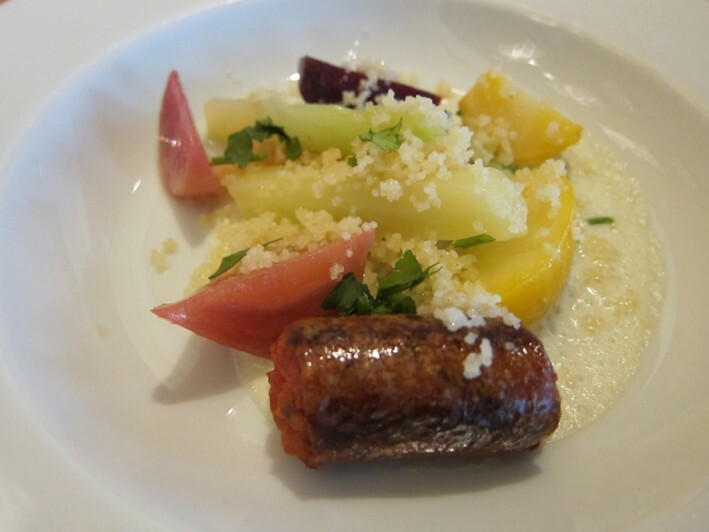 During this trip we dined at Helene Darroze & Taillevent which were both much much better in all departments. At the time the former was a 2 star & the latter a 3 star (which I note at time of writing is down to 2 stars).